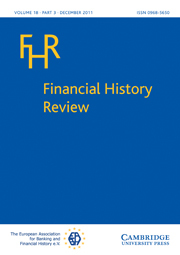 The Financial History Review Bibliography is an authoritative guide to works published in the field of Financial History since 1990. This consolidated version of the printed bibliography brings together in a searchable database, every record collected since 2000. The EABH e.V. and Cambridge University Press are collaborating to digitise additional records dating back to the first appearance of the bibliography in the Financial History Review in 1993, producing a rich interactive resource, crucial to the research of scholars interested in the study of financial issues through time.